Republican Sen. Ron Johnson suggested Sen. John McCain's recently diagnosed brain tumor may have played a role in his deciding "no" vote against skinny repeal of the Affordable Care Act. "We did get a call from Paul [Ryan] and he assured us that skinny repeal…would have to go to conference. Again, I'm not gonna speak for John McCain — he has a brain tumor right now — that vote occurred at 1:30 in the morning, some of that might have factored in." More from Johnson: "Again, I-I-I don't know exactly what — we really thought — and again I don't want speak for any senator. I really thought John was going to vote yes to send that to conference at 10:30 at night. By about 1, 1:30, he voted no. So you have talk to John in terms what was on his mind." Think back: McCain and Johnson both took part in a press conference — along with Sen. Lindsey Graham — hours before the skinny repeal vote where they refused to vote for the bill without clear assurance from the House that it wouldn't become law. McCain's response to Johnson's quote: "It is bizarre and deeply unfortunate that Senator Johnson would question the judgment of a colleague and friend. 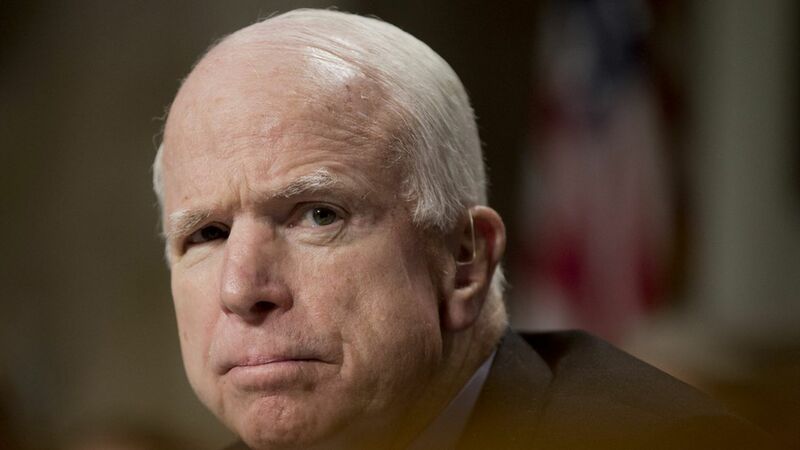 Senator McCain has been very open and clear about the reasons for his vote." A statement from Johnson: "I'm disappointed I didn't more eloquently express my sympathy for what Sen. McCain is going through. I have nothing but respect for him and the vote came at the end of a long day for everyone."